Ili or Ili Kazakh Autonomous Prefecture in northernmost Xinjiang is the only Kazakh autonomous prefecture in China. The Ili Kazakh Autonomous Prefecture is west of Mongolia, south of Russia and east of Kazakhstan. Its foreign boundary is 2,000 km (1,200 mi), generally located between Altai Mountains and the main range of Tian Shan, occupying most of the Dzungarian Basin in northern Xinjiang and the Ili River Basin. The prefecture-level city of Karamay is completely surrounded and divided by the Ili Kazakh Autonomous Prefecture but is not part of it. The upper course of the Ili River and that of Irtysh River flow through the prefecture. As a Sub-provincial Autonomous Prefecture, Ili Kazakh Autonomous Prefecture is administratively divided into three parts -- Altay Prefecture and Tacheng Prefectures, together with a directly administrated county-level prefecture that includes Yining City, 2 other county-level cities, 7 counties, and 1 autonomous county (see Administrative divisions of the People's Republic of China#Levels). The directly administrated region is exactly coterminous with the historical area that in the past was often called by Russians and Westerners as Kulja or Kuldja. Gold Mask Inlaid with Rubies. 3 - 7th Century. 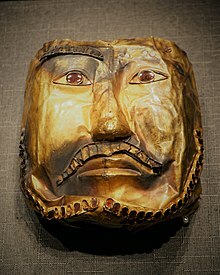 Excavated at Boma Tomb in Zhaosu County, collected by the Ili Kazakh Autonomous Prefecture Museum. Before the advent of the Qin dynasty (221 BC – 206 BC), Ili was occupied by the Ussuns, a tributary tribe of the Huns. The Ussuns were driven away in the 6th century AD by the northern Xiongnu, who established the Turkic Khaganate in 552. Later this Khulja territory became a dependency of Dzungaria. During the Tang dynasty (618–907), the khanate became the Protectorate General to Pacify the West of the Tang Empire. The Uyghur Khaganate, and in the 12th century the Kara-Khitai, took possession of the area in turn. Genghis Khan conquered Kulja in the 13th century, and the Mongol Khans resided in the valley of the Ili. It is supposed that the Oirats conquered it at the end of the 16th or the beginning of the 17th century. The Oirats, or more precisely Dzungars, controlled both Dzungaria and the Ili Basin until 1755 as the Dzungar Khanate, when it was annexed by the Manchu-run Qing dynasty under the Qianlong Emperor. Having defeated the Dzungars in the Dzungarian and Ili Basins, as well as the Afaqi Khojas in Kashgaria, the Qing court decided to make the Ili basin the main base of their control in Xinjiang. Huiyuan Cheng 惠远城 Kürä Shahr Huiyuan Town (惠远镇) in Huocheng County The Old Huiyuan was the residence of the General of Ili from 1765 to 1866. 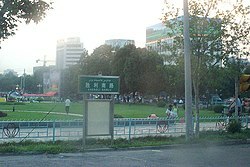 The New Huiyuan was the residence of the General of Ili from 1894 to 1912. Also known as New Kulja, Manchu Kulja, or Ili at the time. Suiding Cheng 绥定城 Ukharliq Shuiding Town (水定镇), county seat of Huocheng County since 1966 General of Ili's residence 1762–1765 and 1883–1894, when it became known as New/Manchu/Chinese Kulja. County seat of Suiding County (1888–1965) and Shuiding County (1965–1966). Renamed Shuiding in 1965. Huiyuan Cheng, as the seat of the General of Ili, the chief commander of the Qing troops in Xinjiang, became the administrative capital of the region. It was provided with a large penal establishment and a strong garrison. This city was called New Kulja, Manhcu Kulja, Chinese Kulja, or Ili by the Russians and Westerners, to distinguish it from Nigyuan/Yining, known as Old Kulja or Taranchi Kulja. The first General of Ili was Ming Rui. The Qing tradition, unbroken until the days of Zuo Zongtang in the 1870s, was to only appoint Manchus as officials in Xinjiang. During the insurrection of 1864 the Dungans and Taranchis of the area formed the Taranchi Sultanate. Huiyuan (Manchu Kulja) was the last Qing fortress in the Ili Valley to fall to the rebels. 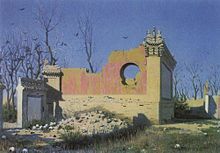 The insurgent Dungans massacred most of Manchu Kulja's inhabitants; Governor General Mingsioi (Ming Xü) assembled his family and staff in his mansion, and blew it up, dying under its ruins. The sultanate led to the occupation of the Ili basin (Kulja in contemporary Western terms) by the Russians in 1871. Ten years later the territory was restored to China, and its boundary with Russia was assigned in accordance to the Treaty of Saint Petersburg (1881). After Chinese authority was restored, a new Huiyuan Town was built, some 4 km (2.5 mi) north of the old Huiyuan site. On January 7, 1912, Yang Cuanxu [zh] of Ili occupied Huiyuan Town and shot the last Qing General of Ili, Zhi Rui [zh]. In July 1945, Chingil, Bole and Quanxi (精河、博乐、温泉) of Ili were made into a new autonomous prefecture now not part of Ili: Bortala. 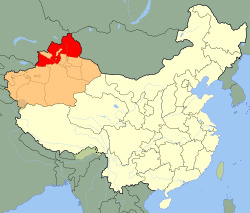 In 1949, Ili was made a special area (专区) of Xinjiang, with one city and nine counties, and was upgraded to a city in 1952. On November 27, 1954, the Ili Autonomous Prefecture was established to include the prefectures of Ili, Altay, and Tacheng. The Ili Prefecture was abolished in 1955. Its one city and nine counties are now under the direct control of the autonomous prefecture. Ili Kazakh Autonomous Prefecture is a famous tourist destination for its relatively humid climate, which earned its reputation as 'wetland in Central Asia'. Major tourist attractions include Narati Grassland, Guozigou and Kanas Lake. In 2015 alone, Ili has seen over 25 million travellers and earned over 19 billion CNY (US$2.92 billion) tourism receipts. An extensive road network is being built across the prefecture for economic development. In 2015, 66 million passengers travelled on road. The railway has extended to both the very north part of Altay City and the westmost city of Khorgas on the China-Kazakhstan border. ^ "National Data". Retrieved 18 April 2016. Wikimedia Commons has media related to Ili Kazakh Autonomous Prefecture. This page was last edited on 28 March 2019, at 08:23 (UTC).